Winter is the season when most potholes appear on roads. But is the problem becoming worse year-on-year? You might not see them as you drive along the UK's roads, but the chances are you'll feel them. Potholes - collapsed areas in the tarmac resulting from the pressure of traffic and bad weather - are a menace for motorists. They send a shudder up the spine, damage vehicles' suspension and can make them career in the wrong direction. Cyclists are vulnerable to being thrown from their saddles, with potentially deadly consequences. The AA says insurance claims for accidents involving pothole-related repairs are on the increase and, in October's Budget, Chancellor Philip Hammond promised an extra £420m for councils in England to deal with "potholes, repair damaged roads, and invest in keeping bridges open and safe". The Asphalt Industry Alliance (AIA) - whose members supply much of the materials used for filling in holes - claims £9.79bn is needed over 10 years to bring roads up to scratch. Main roads and motorways in England, Scotland and Wales are maintained by Highways England, Transport Scotland and the Welsh Government respectively. Councils are responsible for the upkeep of local, usually more minor roads. A freedom-of-information request by the RAC to Highways England found there were 528 successful claims relating to vehicle damage caused by potholes in 2017/18. This was more than double the 212 recorded in 2016/17 and the 187 in 2015/16. The government says the "Beast from the East" - the unusually cold spell early last year - was at least partly to blame for the spike. 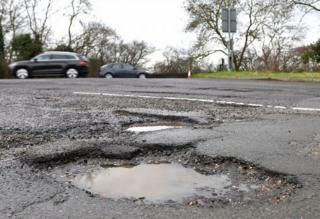 When it comes to minor roads, though, English and Welsh councils are fixing fewer potholes. The AIA's own annual Local Authority Road Maintenance survey found the average number filled in by each local authority in England in 2012-13 was 16,041. By 2018/19 this had fallen to 15,067. In Wales, the number declined from 7,082 to 2,531. Nicholas Thom, assistant professor of engineering at Nottingham University, says that just because fewer potholes are being fixed by councils, it doesn't mean roads are improving. "The situation's definitely worse than it was a few years ago", he says. "There's no denying that fewer are being fixed, so it's more than likely the backlog of repairs is increasing." The Insurance Emporium company put in a freedom of information request to councils in England, Scotland and Wales about the number of potholes recorded year-by-year. In 2015, the total figure was 946,125, rising to 1,088,965 in 2016 and falling back to 986,956 in 2017. The number given for 2018 was 789,902, but this only went up to the end of April, when the inquiry was made. So the number for that year could well be higher than for previous years. For England and Wales, the Local Government Association argues that central government should give some of the money it gets from fuel duty to councils to improve roads. It says local authorities are fixing a pothole every 21 seconds. But what exactly is a pothole? The question is more complex than it might appear. For motorways and trunk roads, Highways England says there is "an overarching requirement to make safe any defect", but "as a minimum requirement" potholes greater than 150mm (5.9 ins) in diameter or 40mm (1.6 ins) deep "must be repaired within 24 hours". But for smaller roads, maintained by councils, there's no single definition of how deep or wide a depression in the tarmac has to be to qualify as a pothole. Experts, like the public, just know one when they see - or feel - one. The peak period for potholes is January and February, generally the coldest months of the year in the UK. Another prolonged freeze, as happened in 2018, would make the situation worse. "Much will depend on the severity of the weather, but a legacy of maintenance backlogs continues to leave many UK roads with the potential to turn treacherous," says AA spokesman Luke Bosdet. Another measure sometimes looked at (albeit not one involving huge numbers) is the number of deaths and accidents involving cyclists in which a "poor or defective road surface" is cited as a cause. The Department for Transport found the total across Britain almost quadrupled from 17 in 2007, to 64 in 2016. We're likely to get a fuller idea of the state of roads in the near future. It's hoped that sensors built in to vehicles will allow real-time logging of the situation on roads - and quicker repairs. "Potholes are a huge problem for all road users," says a Department for Transport spokesman, "and the government is taking action, providing local authorities with more than £6.5bn for roads maintenance and pothole repair in the six years to 2021." The government is investing £900,000 in schemes to allow councils to manage and plan maintenance works "more efficiently". They may be getting worse, but potholes are by no means a new problem. In 1910 the Times printed a letter from a reader, complaining that "a constant succession" of them was making travelling "a pain rather than a pleasure". At least car suspensions have improved since then.